The memorial is to be found inisde the gate of the churchyard. It is made from stone and has a base sourmounted by a two-stepped pedestal, a shaft and cross with inscriptions on two sides of the pedestal. On the front face of the cross is a sword of sacrifice mounted in relief. There are six names for World War 1 by surname, forename, rank and Regiment, there are a further four names for World War 2 listed in the same manner. The memorial was first dedicated by the local clergy and dignitaries on 11th July 1920 and ahain on 11th November 1954. The original mason was J C Coles. Within the church of St Michael is a handwritten Rol of Honour, framed, inside a window recess on the left of the doorway, it is badly faded. There are also two personal plaques in the church. On November 11th at 11am an Armistice was concluded and the Great European War 1914-1918 came to an end. in memory of the men of Finmere Parish who fell in the Great War was dedicated by the Reverend T.H. Archer Houblon. There were a large number present at the Service and the Last Post and Reveille were sounded by boy buglers from Magdalene College School, Brackley. The Cross is of Honiton Stone and the work was done by Messrs Coles of Brackley at a cost of £80, the money being willingly subscribed by parishioners and others connected with the Parish. The memorial stands in the churchyard. See the Finmere Website. Private 8578, 2nd Battalion, Northamptonshire Regiment. Killed in action Sunday 14th March 1915 at the fateful battle of Neuve Chapelle. Born Paulerspury, Nothamptonshire, enlisted Northampton. Commemorated on LE TOURET MEMORIAL, Pas de Calais, France. Panel 28 to 30. Private 5762, 2nd Battalion, Oxfordshire and Buckinghamshire Light Infantry. Killed in action at Festubert on Sunday 16th May 1915. Aged 34. Born Finmere, enlisted Banbury, resident Leeds. Son of John and Ann Clifford of Lower End, Finmere; husband of Elizabeth Clifford of of 5, Shag Terrace, Woodhouse St., Leeds. Commemorated on LE TOURET MEMORIAL, Pas de Calais, France. Panel 26. Private SD/659, 11th Battalion, Royal Sussex Regiment. Killed in action Sunday 3rd September 1916. Age 26. Born Finmere, enlisted Willesden, Middlesex. Son of Thomas 9"Tommy-Dodd" and Margaret Clifford of Finmere. Eldest of eleven children. Commemorated on THIEPVAL MEMORIAL, Somme, France. Pier and Face 7 C.
[Spelt DAVIS on CWGC] Private 5769, 1st/4th Battalion, Royal Fusliers. Died 12th October 1916 in France & Flanders. Age 36. Native of Finmere, Buckingham. Son of Thomas and Louisa Davis of 167, Hoxton St., Shoreditch, London. Buried in ST. SEVER CEMETERY, ROUEN, Seine-Maritime, France. Grave B. 14. 33. Lance Corporal 220081, 2nd Battalion, Royal Berkshire Regiment. Killed in action Friday 15th February 1918. Born and resident Finmere, enlisted Oxford. Formerly 204129, Oxfordshire and Buckinghamshire Light Infantry. The Paxtons were a long established Finmere family. Commemorated on TYNE COT MEMORIAL, Zonnebeke, West-Vlaanderen, Belgium. Panel 105 to 106 and 162. OF 17TH NOVEMBER 1914 NEAR YPRES. On Remembrance Day, 11th November, a panel of the War Memorial Cross recording the names of the men who gave their lives in the 1939-1945 war was unveiled. The local branch of the British Legion attended the service and laid a tribute at the Memorial. 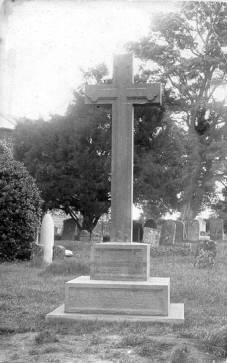 The Cross was cleaned and the additional work done by means of a house-to-house collection in the parish and a small sum from the Barrett War Memorial bequest. Gunner 1427327, H.Q. 6 H.A.A. Regiment, Royal Artillery. Died on Sunday 29th November 1942. Age 27. Son of Albert and Hannah Buck; husband of Olive Alice Buck, of Finmere, Buckinghamshire. Died in a POW camp at Fukuoka. Commemorated on YOKOHAMA CREMATION MEMORIAL, Japan. Panel 2. Private 5961893, 2nd Battalion, The Hertfordshire Regiment, Bedfordshire and Hertfordshire Regiment. Died on Thursday 6th May 1943. Age 20. Son of Frank and Sophia Bull, of Finmere, Oxfordshire. Buried in MEDJEZ-EL-BAB WAR CEMETERY, Tunisia. Grave 2. G. 9. Gunner 1712406, 80th Field Regiment, Royal Artillery. Died on Wednesday 25th April 1945. Age 35. Son of John and Alice Horwood, of Little Tingewick, Buckinghamshire. Buried in BECKLINGEN WAR CEMETERY, Soltau, Niedersachsen, Germany. Grave 4. L. 4. Note: The names here have been sorted intyo alphabetcial order for ease of reading.